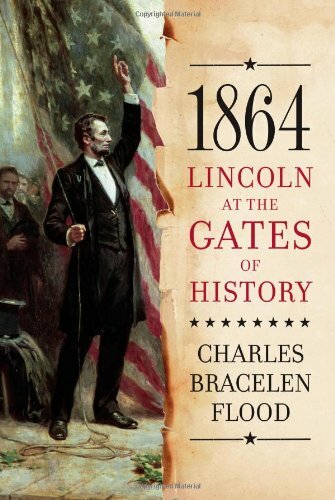 This book concentrated on the pivotal year of history of 1864 during the Lincoln Administration telling about the political problems that impacted the President while he was working toward re-election. The political environment in 1864 was extremely complicated because of the splits in the parties - Conservative Republicans who supported Lincoln, Radical Republicans that questioned his handling of the South, Peace Democrats who advocated compromise, and War Democrats who wanted to fight and didn't care about the slaves. The historical events of the year - battles including the Wilderness Campaign, Lincoln's handling of Military leadership problems, the death of Chief Justice Taney, and issues with his own wife clashed with his efforts toward re-election. Lincoln felt that there was a good chance that he would not be returning to the Presidency and seems to be surprised when it does happen. This terrific recent contribution to Lincolniana manages to convey reverence for Lincoln without falling into the tempting trap of hagiography that so often characterizes books on Lincoln. Furthermore, although it’s a story familiar to many, Flood tells it in a most entertaining way, from a refreshingly objective perspective. Flood has said in interviews that he believes there are only two years in American history that are absolutely critical, pivotal years: The first was 1776 and the second was 1864. This last full year of Lincoln’s life wrenched the President and the public from one end of the emotional spectrum to the other: for a while it looked like the North had lost the Civil War, as disasters and dead bodies mounted on the battlefields. Then Sherman took Atlanta followed by Savannah, and Sheridan tamed and reclaimed the Shenandoah Valley. Similarly, Lincoln’s prospects for winning a second term went from absolutely zero to overwhelmingly positive. And throughout this entire whip ride, Lincoln was manipulating everything and everybody he could, behind the scenes. A little background: the Civil War started just five weeks after Lincoln’s first inauguration on March 4, 1861. By 1864, close to a million Union soldiers faced 700,000 Confederates. Also by that year, some quarter million Union soldiers were already lost from all causes. In addition, more than 100,000 had deserted. Politics in the North was mainly divided into four camps: the “conservative” Republicans who supported Lincoln’s approach; the “Radicals” who thought Lincoln was too conciliatory toward the South; the “Peace Democrats” who wanted immediate peace negotiations and compromise with the South; and the “War Democrats” who were willing to keep fighting but did not care about the status of the slaves. Salmon Chase, the Secretary of the Treasury, was another potential threat to Lincoln’s reelection. Chase, favored by many Radical Republicans, saw the election results of 1860 (in which he also ran) as a hideous mistake, and hid his thirst to be president from no one. Chase was contemptuous of Lincoln. Although Lincoln’s origins were humble, Lincoln the man was nothing of the kind when it came to his sense of intellectual superiority, and he didn’t hesitate to let others know this. Chase burned with resentment over the presumption of such a bumpkin! As for Lincoln, he wasn’t so fond of Chase either, but thought he would do a good job at Treasury. More importantly, however, for Lincoln, with Chase serving in the Cabinet, it would be too awkward for him to come right out and challenge for the 1864 presidential election the man it was his duty to serve. At the Republican convention in June, Flood gives evidence that Lincoln himself desired, and worked for (surreptitiously), the nomination of Andrew Johnson as his vice-presidential candidate. Johnson, a Democrat from Tennessee, was the only senator from the states that seceded who remained loyal to the Union. Lincoln felt his nomination would have powerful symbolic importance. In one sense his selection would be a concession to the South and evidence of the rewards of staying in the Union. In another, it would be “something of a political offensive into the South to parallel the military advances.” And finally, Lincoln thought that to nominate a Southerner who was a Union loyalist would prove to England and France (in danger of recognizing the Confederacy as a separate country) that America as one country was still viable. Most people know that during the War, Lincoln suspended habeas corpus. (Habeas corpus, or the Great Writ, is the legal procedure by which prisoners can challenge the legality their detention; it was designed as a protection against the government from holding people indefinitely without showing cause.) But the extent to which his administration had people jailed questionably is not as well known. Not all of the people who landed in prison had engaged in “seditious” behaviors. Sometimes, however, the extra vigilance was justified. The Confederate Secret Service, operating in Canada, came up with a number of plots to destabilize the North. Confederate sympathizers in the North also worked against the government. One notable plan Lincoln discovered in 1864 involved a conspiracy by a secret organization to stage an armed insurrection, taking Ohio, Indiana, Illinois, and Missouri out of the Union in a second secession. This “Northwestern Confederacy” would then hopefully attract membership by Michigan, Wisconsin, Minnesota, Iowa, and Kansas. Then, they would form a partnership with the South. With all his problems of state, Lincoln had trials on the home front as well. Mary had become more and more unstable since the death of their second son Willie in 1862. She eased her anxiety by having séances conducted in the White House, and by compulsive shopping, once buying 400 pairs of gloves in three months. She also bought several shawls for $650 each and a cashmere for $1,000. Meanwhile Lincoln wore the same ratty, ill-fitting suit every day, and carried out affairs of state in worn carpet slippers. He did not give money to Mary for her shopping; rather, she “appropriated” it from other funds. As an example, in return for splitting half the money with her, she got the Superintendent of the White House grounds to come up with fake receipts for flowers, trees, bushes, and equipment. Soon she expanded her scam into the White House kitchen. A final note on Lincoln’s last full year: On Christmas Eve, his friend Orville Browning convinced Lincoln to go in on a cotton deal that might have made Lincoln a million dollars. The gray trade in cotton and tobacco had proceeded throughout the war; it was in the interest of both sides to ignore it. Lincoln just had to writes passes for the middlemen to go back and forth to the South unharmed through Union lines. Flood said it was “legal but perhaps an unethical conflict of interest,” and it probably would have been a huge scandal had it gone through. Ironically, when Lee evacuated Richmond three months later, he burned the warehouses that were to provide goods for the deal, so it was never consummated. Flood’s Lincoln is not a saint. Rather, he is a real human being who is not only inordinately compassionate and patient, but also a brilliant and savvy manager who compromised his standards when necessary to achieve his goals.